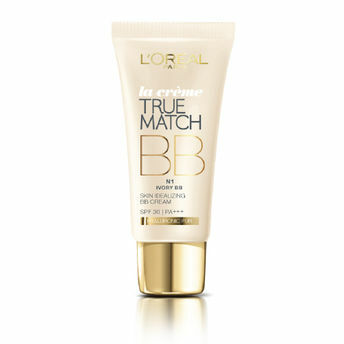 L'Oreal True Match BB Cream nourishes, moisturises and covers uneven skin tone and imperfections. It is a one of a kind hyaluronic BB cream, which helps retain natural skin moisture for healthy skin which is customised to match different skin tones. The goodness of micro-pigment capsules retextures, retones and revitalises uneven skin and consists of an anti-ageing formula to smoothen your skin texture. The SPF 35 PA+++ content aids in sun protection and acts as a protection against skin damage due to environmental assaults. Give your skin a daily dose of protection from sun ray damages. As the biggest beauty brand in the world, L'Oreal Paris has an unparalleled commitment to technology, research and innovation and providing groundbreaking, high-quality products for women, men, and children of all ages and ethnicities. The LOreal Paris brand encompasses the four major beauty categories - hair color, cosmetics, hair care, and skin care ?" and includes such well-known brands as Excellence Creme, Total Repair 5 hair care, Youth Code, Fall Repair, Revitalift, Volume Million Lashes Mascara, Colour Riche lipsticks, Superliners and True Match foundations among many others. Alternatively, you can also find many more products from the L'Oreal Paris True Match BB Cream range.